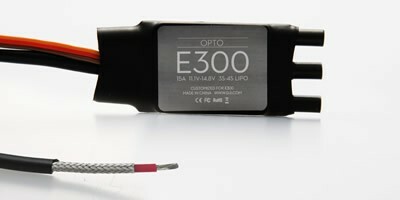 The DJI E300 15A Opto ESC is a replacement ESC for the E300 Tuned Propulsion system. The E300 Motor & ESC's are the first power solution designed for multi-rotor use, the higher thrust to weight ratio from the E300 system increases the reliability, stability and agility of flight through enhanced aerodynamics and efficiency from the motor and propeller combination. The E300 ESC is desined to work with the Tuned Propulsion system and the recomended propeller to use is the 9.4 x 4.3 with the E300 Motors which deliver an average of 20-25% improvement over the 8 x 4.5 propellers without the need for an increase in motor size. The higher lift generated from the new profile propeller means that payloads can be increased without the need to upgrade the system.